Set in an early-twentieth century neighborhood in SE Portland filled with lush greenery, this Eastmoreland home was past due for some loving updates. You may have seen our previous basement renovations of this home not too long ago. Well we can officially say the rest of the home is finished! Allison knew she had to stick to period friendly elements to match the neighborhood–nothing too modern that would be dated in a few years. The ultimate goal was to maintain the home’s authenticity while still giving it a functional update. When Allison hopped onto this project, she immediately identified issues with the existing floor plan. There were unnecessary exterior doors and space being taken up by previous unprofessional planning with home renovations. In order to open the kitchen up and give it the space it deserved, she planned to take out the existing exterior door and close off the doorway into the now office. A new exterior door was placed near the master suite at the end of the hallway leading into the backyard. One of the biggest requests of our clients was to fix the lack of privacy for each of the older daughters who desperately needed their own bedrooms, as well as to make each bedroom more functional. (None of them had closets!) To remedy these problems, Allison designed a new bedroom space in the basement for one of the girls and reworked the upper level for the other where they were both initially sharing a room. This also solved the problem of the girls and father having previously been made to share one bathroom. Allison implemented a new joint bathroom/laundry room in the basement that the oldest could use as her personal bathroom. Of course a renovation project this big came with it’s challenges. Initial design plans included adding a third bathroom to the upper level of the home so that everyone would technically have their own bathrooms. Unfortunately the city shut down those ideas which forced Allison to maximize the existing space she was already working with. The most drastic changes are clearly seen in the kitchen and the bathroom on the main floor so these are naturally Allison’s favorite two rooms of the finished product. Allison’s design inspiration for the kitchen came from vintage tin ceiling tiles. She found the subtle, yet beautiful tile used in the kitchen back splash and knew she had to use it for this project. Our team is incredibly proud of this project and we thoroughly enjoy showing off these before and after shots. Feel free to ‘ooh’ and ‘ahh’ as much as we have. Things We’re Leaving Behind in 2017… Well, Technically 1997. Okay, this blog is all about outdated (or just weird) home trends. Feel free to comment anything we left out! Let’s start with those U-Shaped toilet rugs…. Just…. why. Why did anyone think it was a good idea to draw attention to a toilet? Here at ASD we’ve nicknamed these rugs “toilet corrals”. 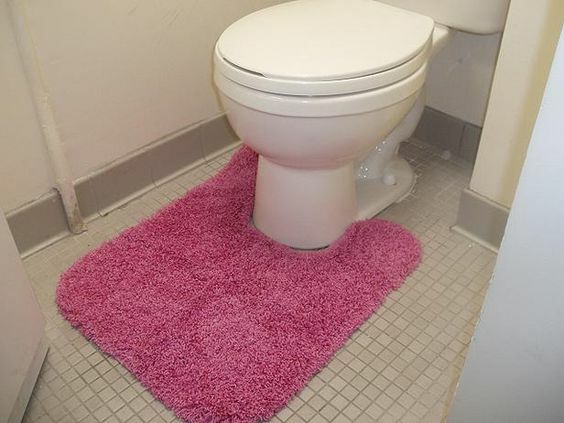 Below are some more tasteful ways to place a rug under a toilet, if you must. And while we’re on that note, toilet seat cushions. Aesthetics aside — this is just gross. Don’t do it. There’s really nothing wrong with using fabric on your window treatments, it’s more the valance we’re saying “no” to. Pepto-Bismol Pink. Pantone named “Rose Quartz” the Color of The Year in 2016, but let’s be honest, they should’ve just called it Pepto-Bismol. For whatever reason, this color really caught on. I have one word it…. YEESH. If you’re a fan of pink, we recommend going with a “less is more” approach. We also recommend going with a toned-down Pepto-Bismol, or a shade that’s a little rosier.. This color just has an elegance about it that *nausea, heartburn, indigestine..* doesn’t. I could go on forever about decorating faux pas, but I’ve got some real designing to do. I’d love to hear what you think we should leave behind in 2017! Madison Way apartments, located in the greater Seattle area, received Allison’s magical touch – just in time for fall. The rec center features camel-colored furniture, which we’ve nicknamed “pumpkin spice” after the famous Starbucks fall-time drink. A sleek waterfall quartz kitchen island blends beautifully into the concrete-tiled floor. A large piece of driftwood, which spans half the length of the island, works beautifully as a statement piece, and harkens back to the “pumpkin spice” furniture. While we’re speaking of statements, I ought to mention the kitchen backsplash we chose. 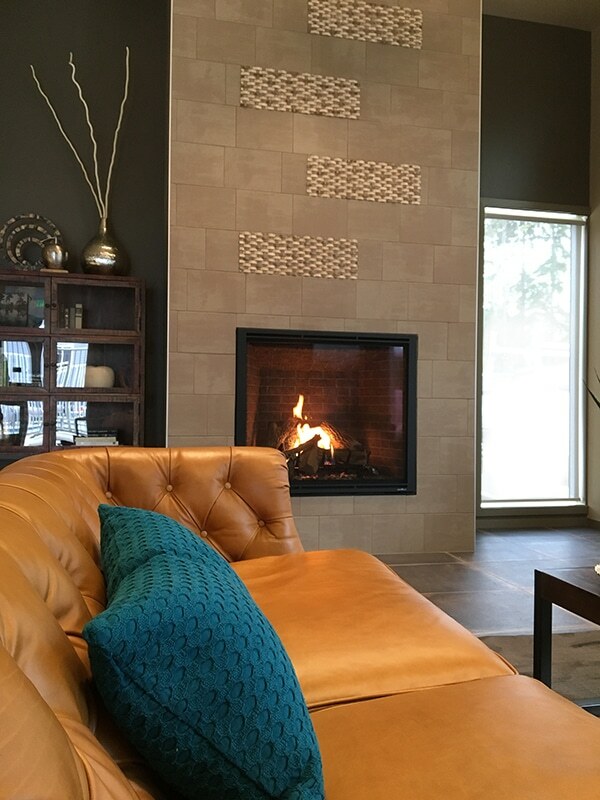 This rec center simply couldn’t be cozier… makes you want to grab a pumpkin spice latte and a great book to read by this fireplace. This adorable home in southeast Portland’s desirable neighborhood of East Moreland is in need of some TLC. A couple years ago, Allison Smith Design remodeled the entire basement. Keep in mind, this is in a basement. There isn’t a single window in the space. Light and bright paint colors + light and bright materials + a few contrasting pieces = a beautiful, bright space.. even without natural light. Beginning fall 2018, Allison Smith Design is taking on this adorable home again… This time to transform the two upper levels.